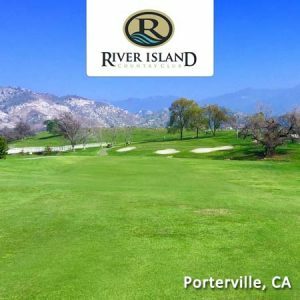 Located in the Sierra Foothills, River Island Country Club combines beautiful scenery with the highest course and slope rating in both Kings and Tulare counties. Enjoy a private club experience that is also open to the public after 10am Tuesday- Sunday. Towering native oaks and giant sycamores complement this challenging 6910 yard, 18 hole, championship golf course. The ever present Tule River tests the golfer skills and provides an unmatched setting for your enjoyment. River Island has been designed to challenge the very skilled and also provide fun and enjoyment for the less proficient golfer. 31989 River Island Drive – Map it! $49 paid value does not expire and may be used toward the purchase of regularly priced green fees after promotion expiration.